Poor brek is severely constipated! That was definitely the hardest thing I have had to watch my baby go through! So bad I had to give her a laxative to help her...she just screamed and held her breath the whole time which made it worse! Poor thing, let's just say that we are going to try oatmeal and more fruits rather than rice cereal! 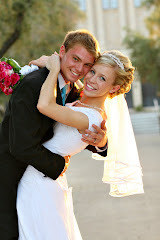 Jeremy and I have been married for four years now and have enjoyed every minute of it! We love being parents to a beautiful little girl! She is such a blessing!